I purchased the new 80GB iPod 5.5G model today because I need to do some video testing with it. Along the way I figured I'd download a movie and a game to see how the new store features work. The purchase experience and the user interface are both horrid. 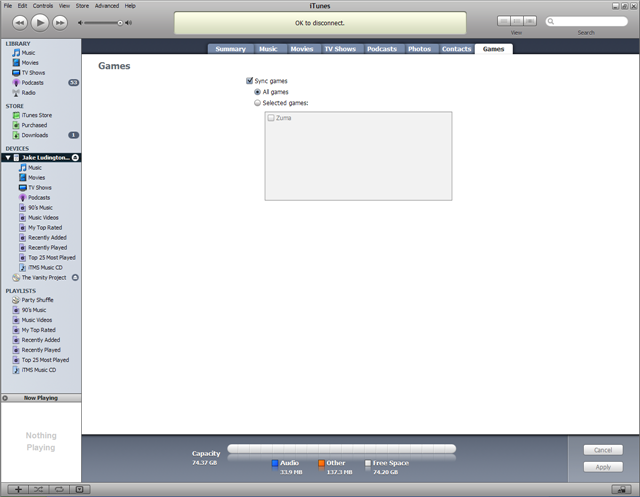 After buying Zuma twice, I had to enable interface features to even find the game in iTunes. I'm someone who looks at software UI every day, how are normal people dealing with this? I started out purchasing a copy of Mulan with my card on file in the iTunes store and then proceeded to purchase Zuma. All seems good. Looking in my Purchased folder, I can see the episode of Desperate Housewives I purchased last year when Apple first announced video sales and Mulan, which is currently downloading. No Zuma. Maybe the sale didn't take, so I try it again. 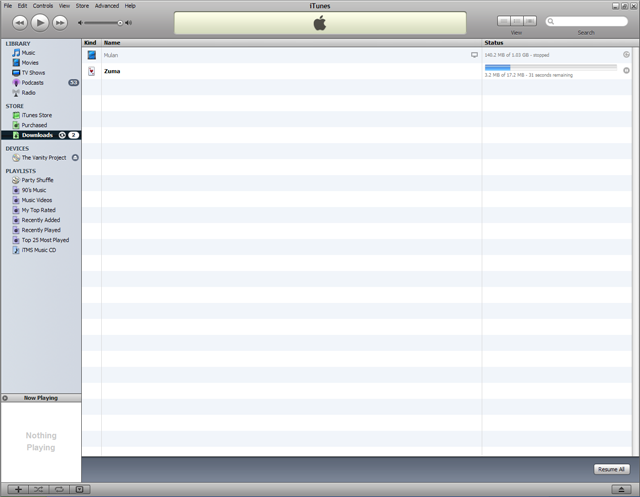 According to iTunes Store, I already purchased Zuma. Or so the dialog box tells me. 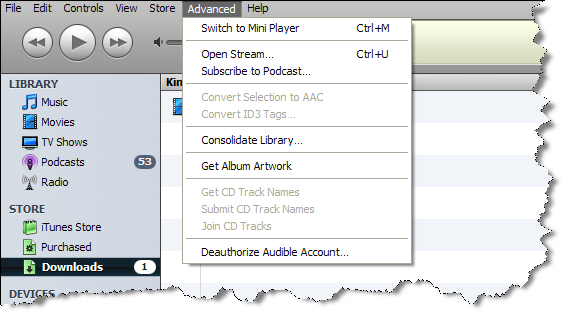 Following directions and looking under the Advanced menu, I see no option to Check for Purchased Music. 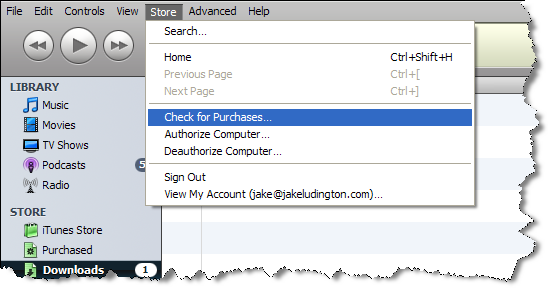 Using Check for Purchases and providing my password takes me back to the Purchases folder with the same two results. Desperate Housewives and Mulan, but no Zuma. I paused the download of Mulan, which froze iTunes and forced me to do an End Task to shut it down. After rebooting my machine to see if that fixes Zuma not showing up, I relaunch iTunes and still no Zuma in the interface. I open the iTunes Store and attempt to purchase Zuma one more time. This time when I click the Zuma buy button I am told I may have duplicate items. I clicked Buy just to see if I could finally get the game. This time, Zuma shows up in the Downloads along with Mulan. After downloading completes, the game was nowhere to be found in iTunes. 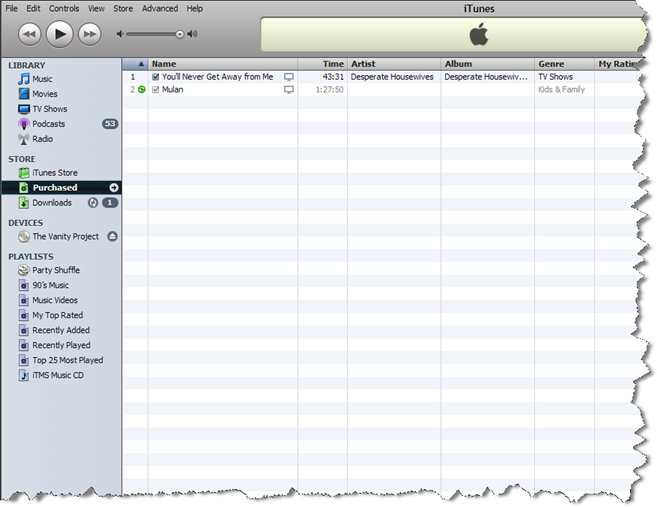 I connected my new iPod and saw the game sync in the status bar at the top of the iTunes interface, so apparently it's on my machine somewhere. 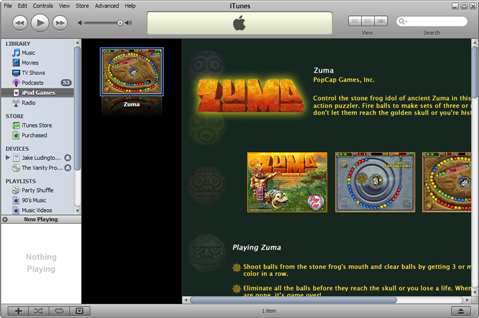 After syncing I saw Zuma in the iPod browser in iTunes. After further digging around in iTunes, I finally find an option to check the box next to iPod Games in the Edit > Preferences menu. Hello Apple People! This should have been enabled automatically or at the very worst it should be enabled the second I make a game purchase. What a craptacular experience. This is the kind of UI I expect from Microsoft, complete with incorrect dialog boxes. Where's the consistent Apple user experience? It cost me a second download of the same game and even then, I don't see a quantity of two in the games list. Maybe I was supposed to buy a Mac before downloading? I have one. It doesn't have all my music on it because I started ripping music before OS X exsisted and you couldn't pay me to own a Mac before OS X. Most iPod customers are Windows users, which means the Windows iTunes experience better rock harder than the Mac experience or you will lose customers. At the end of the day, I'm only out $4.99, which isn't a huge thing, but it's the principle of getting a bad experience. I'm probably not the only confused customer. The question is, how much of the early sales figures were seeing from Disney can be attributed to purchasing errors. If it had been a company I didn't know, I'd have given up after the first try. Apple is generally known for providing a great user experience, so I assumed it was something I did and tried again. 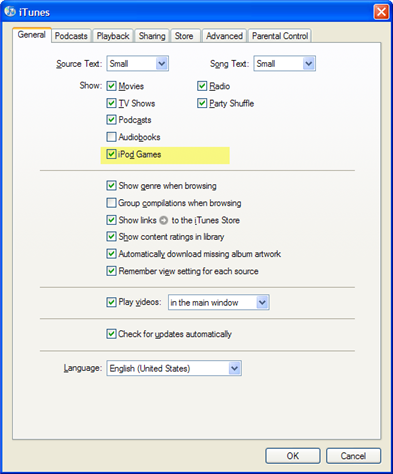 I was on the verge of calling the company when I finally found the hidden setting to reveal the games in the interface. If this is the next generation of customer experience at Apple, we're all in for a rude awakening. In the meantime, I think from this point forward, I'll stick to gaming on my PSP. At least Sony knows how to make the gaming experience just work.